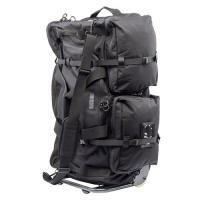 Blackhawk Go Box Rolling Load-Out Bag (With Frame) FREE SHIPPING! If you are planning a backpacking excursion for several days or about to be deployed or need a big emergency bug out bag, you are going to need a backpack big enough, durable enough, to hold all of the essentials. Enter the Blackhawk Go Box rolling load-out bag with frame. With a load capacity of 200 lbs, the Go Box will hold clothing, ammo, body armor, food, medical gear, camping equipment, or anything you can stuff in it. To support the heavy load, Blackhawk crafts this load-out bag using reinforced aluminum frame, heavy duty urethane wheels, and handle and straps. The bag measures 36.5" x 16.5" x 16.5" and is made of durable 1000D nylon. The Blackhawk bag has three external pockets for easy access, removable padded shoulder strap that is comfortable, compression straps with side release buckle and lockable YKK zippers. Blackhawk, producing the finest tactical gear money can buy! ©2002-2019 CopsPlus.com: Blackhawk Go Box Rolling Load-Out Bag (With Frame) FREE SHIPPING!